DETS operates six distance education technology classrooms from which classes are delivered in a variety of live interactive and time shifted formats. There are also a number of technology classrooms, meeting rooms, and a lecture hall in the Jeong H. Kim Engineering Building that are equipped to deliver classes in live interactive and time shifted formats. DETS is headquartered at the A. James Clark School of Engineering at the University of Maryland, College Park. Our offices are located in 2125 J.M. Patterson Bldg. Please see the directions page for directions, parking information and maps. She will be happy to assist you in finding the room that will best fit your needs and schedule. The UCNM center is a cooperative educational facility that houses programs from several universities and colleges. The University of Maryland offers live interactive classes from College Park to the center. The UCNM Center is open to the public and is located on Route 22, less than a mile from Interstate 95, Aberdeen Exit and just down the road from Aberdeen Proving Ground. Visit the UCNM website for more information. FrostburgFSU receives engineering classes from College Park as part of an ongoing collaborative program to enhance FSU’s engineering program, and to provide their students with choices previously unavailable to them. Classes are delivered over the IVN network and are fully interactive. Visit the FSU website for more information. 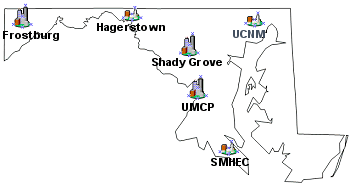 Southern MarylandSMHEC is an educational facility that houses programs from several universities, colleges and technology centers, and offers graduate and upper-division professional degree programs for the professional workforce of the three-county region. The Center is located on its own 24-acre site within the Wildewood Professional and Technology Park in California MD. The building is about one-half mile west of Route 235, on Airport Road. It is centrally located, approximately six miles north of the Patuxent River Naval Base, 22 miles south of Prince Frederick, and 35 miles south of Waldorf. Visit the SMHEC website for more information. USG houses programs from University System of Maryland (USM) institutions. The University of Maryland, College Park offers live, interactive classes from College Park to USG. USG is open to the public and is located to serve the I-270 technology corridor as well as residents of the surrounding area. Visit the USG website for more information. Hagerstown is a University System of Maryland (USM) institution and is located at 32 W.Washington Street, Hagerstown, Maryland 21740 The University of Maryland, College Park offers live, interactive classes from College Park to Hagerstown. Visit the Hagerstown website for more information. National Institute of Aerospace (NIA) is a non-profit research and graduate education institute formed by a consortium of leading research universities. Located in Hampton, VA, NIA is a closed site serving students and researchers affiliated with NASA Langley.